The LSLBO is part of an international effort to monitor landbird migrations and we are a full member of the Canadian Migration Monitoring Network (CMMN). All members of the CMMN track the migration of Canada’s birds in the spring and fall each year, adding to our knowledge of population trends, demographics, phenology, and other essential information about the species that pass through each location. This information is used by governments, environmental organizations, scientists and others to direct our collective actions and improve our ability to conserve Canada’s birds. Migration is monitored during both the spring and the fall. Spring migration begins during the last week of April and ends on June 10th. Fall migration begins July 12th and ends at the end of September. During the migration periods, the lab operates every day for seven hours beginning half an hour before sunrise. The LSLBO incorporates four standardized monitoring techniques into its daily protocol. The LSLBO operates 12 standard nets; these nets have remained in the same location for the entire history of the observatory. The nets used by the LSLBO are 30mm mesh panel nets, 2.6 metres tall by 12 metres long. They are set for seven hours every weather permissible day during both spring and fall migration. For the safety of the birds, the nets are not operated if the temperature is below 0 °C, or during rain or strong winds. Qualified staff members check the nets every half hour for birds. Any captured birds are extracted from the nets and brought to the lab where they are processed. 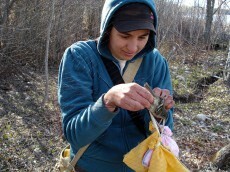 Processing the birds involves banding them, aging and sexing them and then taking a series of measurements. The birds are then released as soon as possible. Every hour throughout the day, field staff conduct a five minute Visible Migration Count at a set location. During this count, only birds seen actively migrating are recorded, this helps to discern the migratory population size from the breeding population size. Every morning, within the first three hours of the day, a half hour census is conducted along a specified route. This route has remained unchanged over the lab history and is approximately 600 metres long running along the edge of the lake. During the spring it is surveyed walking south and during the fall it is surveyed walking north. All birds that are seen or heard while walking the route are recorded. The final monitoring technique is casual or incidental observations. During the course of the day, field staff record all birds that they see and hear in the area. At the end of the day the results from all four monitoring methods are compiled to generate a daily estimated total for each bird species observed in that day. These DETs are used by Bird Studies Canada to generate population trends for bird species within that area. These trends are positively correlated with trends derived independently from the Breeding Bird Survey. You can view LSLBO population trends by visiting the nature counts website.